Golden Bird's-foot Lotus corniculatus ?Plenus? 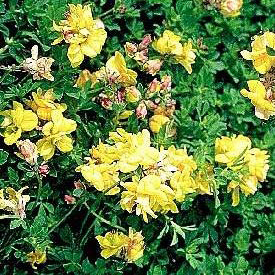 The double-flowered form of Bird's-foot Trefoil, this is a sturdy perennial that will adapt to nearly any sunny situation. Plants form a low, spreading mound of bright green leaves, massed with small golden-yellow pea flowers in early summer. Excellent in hot, sunny areas, this will even thrive in poor soil and makes a terrific lawn substitute. Golden Bird's-footis easily divided in spring or fall by digging up the clump and ripping apart into smaller pieces. A good groundcover or edging plant. Plants will tolerate regular mowing. Semi-evergreen.